A common recipe found in published recipe books and handwritten documents from Jewish Vienna is Kaiserschmarrn, a kind of scrambled pancake with raisins. It is clear that this Viennese recipe spread throughout the German-speaking world, and eventually appeared in cookbooks across German-speaking Europe. There is nothing particularly “Jewish” about it, as with most recipes found in our collections. As an assimilated population, the Jewish cook and baker in Germany or Austria generally made the same recipes as those non-Jews around them, with modifications for those keeping Kosher kitchens. German Wikipedia provides two additional explanations on the creation of Kaiserschmarrn. The first legend says that Emperor Franz Joseph I was offered a Holzfällerschmarrn (a “wood cutter Schmarrn”) while hunting in the Salzkammergut resort area. 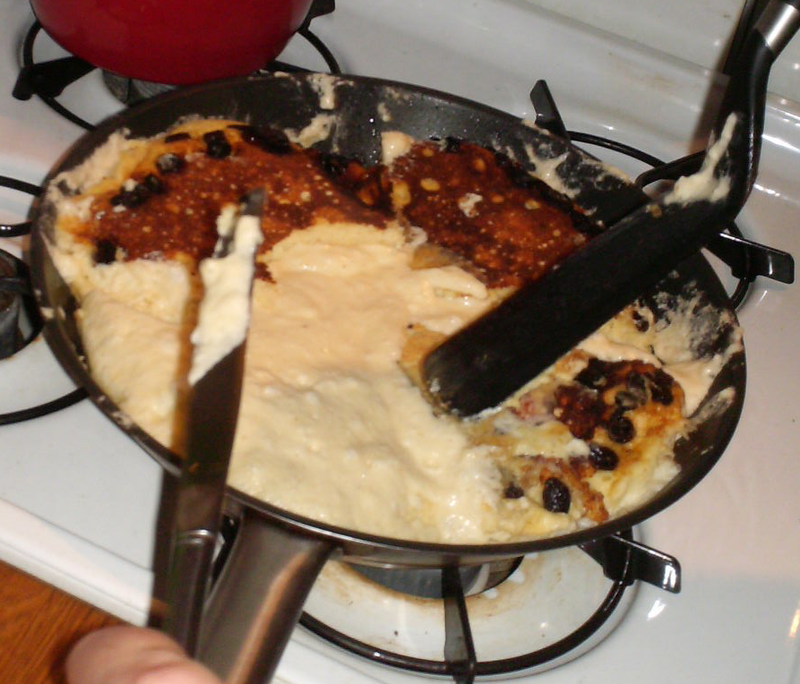 In his honor, it was improved with milk, raisins and eggs. So the traditional Holzfällerschmarrn became the fine Kaiserschmarrn. Separate egg yolks from whites. Be sure no yolk is in the whites. Mix together flour, sugar, salt, yolks and milk in a large bowl. Beat the whites in a glass or metal bowl until they hold medium white peaks. 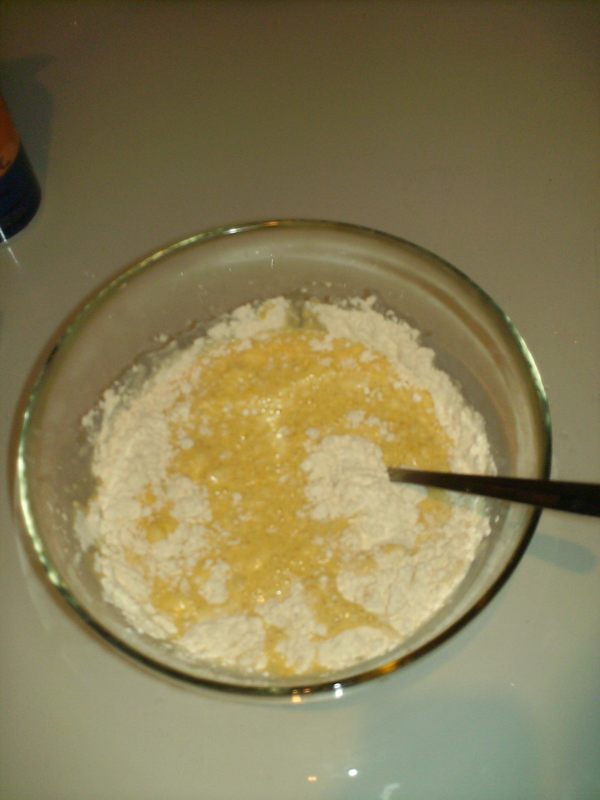 Take a bit of the whites (maybe 25% – 35%) and mix into the flour, sugar, salt, yolk, and milk mixture to lighten it up. Fold in the remaining whites. Try not to lose the fluffiness. It doesn’t have to be perfectly mixed. 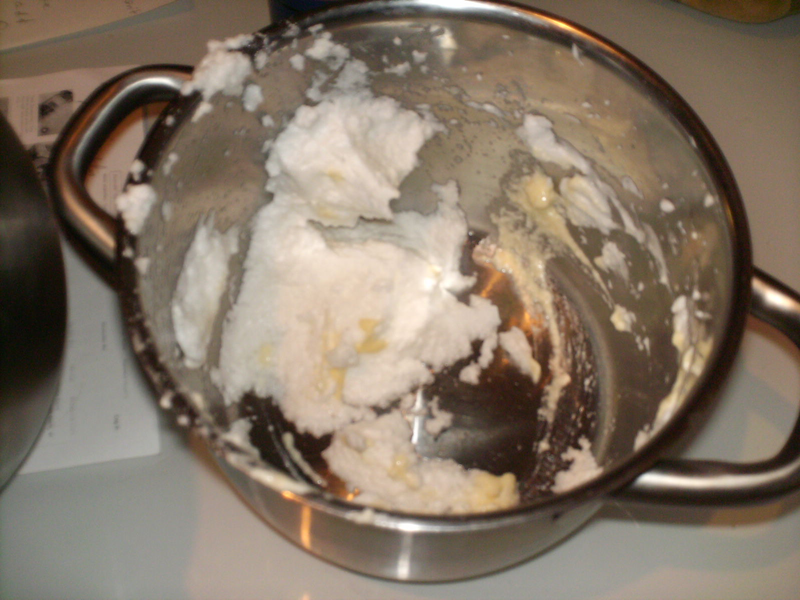 Melt the butter in a large saucepan. If you want to, add the raisins and rum (or Grand Marnier) and sautee for a few minutes. Add the batter to the saucepan. When it seems like the mixture is fairly solid, cut into quarters and flip over the quarters. After a minute or two, cut up the Kaiserschmarrn! 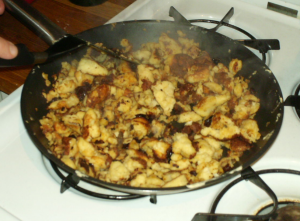 Following are photographs of our Kaiserschmarrn adventure! Separating the yolks was difficult, so we lost a few eggs. We were told separating the egg yolk from the whites was the most important part of the recipe. Another person told me that whatever I did, I was not to let any of the egg yolk get into the whites. I’m not the best egg separator, so lost a few eggs during the process! Flour, egg yolk, milk, etc. all in the process of being mixed together. I have to confess that I think next time I may add one extra egg and a bit more milk. The Kaiserschmarrn we made according to the recipe above was very good, but I personally think it could stand to be a bit more moist. This is the remaining egg whites after approximately 25 percent had been removed and folded into the yolk, flour, and milk mixture. You can see how they are beaten to a consistency of stiff peaks and valleys. 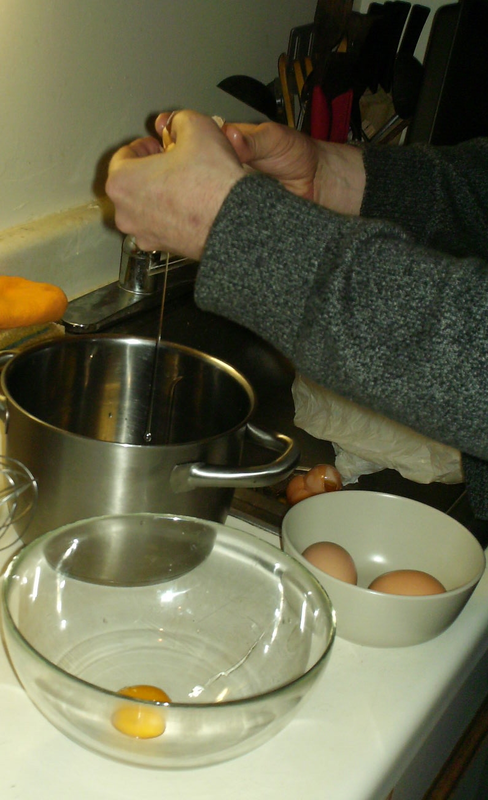 In this picture we are “folding in” the beaten egg whites into the batter. We used a folding motion to try not to flatten the whipped egg whites in the process. 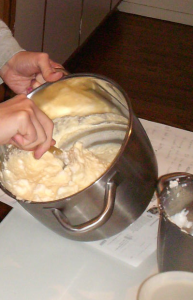 The resulting mixture is foamy and thick. 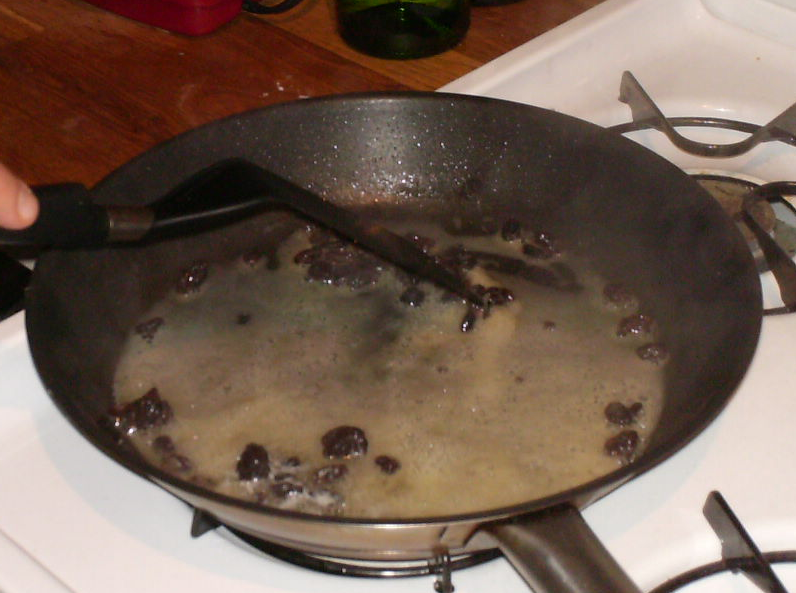 We prepare the pan that will contain the Kaiserschmarrn: in a saucepan we heat up a mixture of rum, raisins, and butter. If I was to do it over I would add a bit more butter and use Grand Marnier instead of rum, as my friend from Vienna suggested. I am preparing to divide the Kaiserschmarrn into four pieces and flip them to cook the other side. The flipping turned into kind of a gooey-mess, but don’t let this scare you! 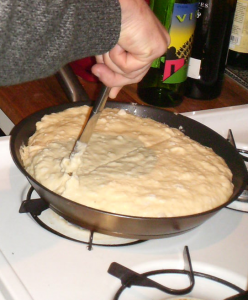 Kaiserschmarrn is essentially a giant pancake which takes up the whole pan and the middle doesn’t get completely hard. If it did, the bottom would burn. Once it is flipped once, it can cook more slowly. All cooked, we have now shredded the pancake into smaller pieces. While it’s a shame to see the pancake be ripped up, I don’t see how the inside can get done if it is kept whole. My friend tells me he manages to keep his whole; apparently practice makes perfect. The finished product! It is topped with the traditional fixings of powdered sugar and plum compote, but you can use what you wish. I made sure to find a nice plate to serve it on, befitting the Emperor of Austria! It was quite good and overall we were pleased with the results. I spoke to my fellow-cook, and she pointed out that we did not make a sauce for it. Traditionally, the Kaiserschmarrn is often accompanied by a vanilla flavored sauce, and if we had made that and poured it over the dish it would certainly have been more moist. Ice cream would have been a phenomenal topping. I can’t imagine how the Empress Elisabeth thought this dish would help her to lose weight. What had she been eating before this “diet dish! ?” Today, this dish most definitely is not considered a “light dessert” by any means. 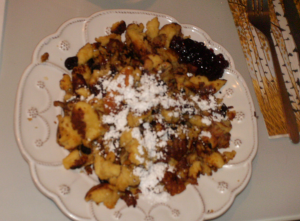 I would definitely make Kaiserschmarrn again; in fact, writing this piece has made me crave some. In a world of no carbohydrate diets and thin waistlines, it’s a guilty pleasure. But most definitely a worthwhile one!